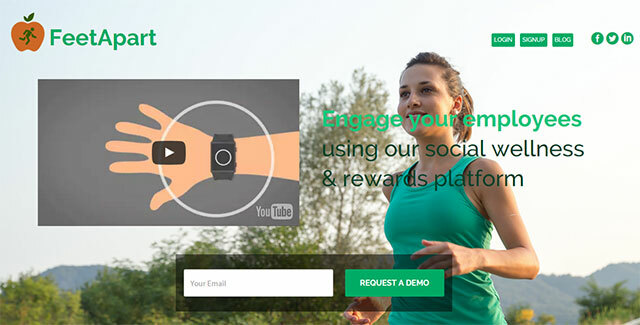 Bangalore-based FeetApart Wellness Pvt Ltd, which runs employee engagement and wellness platform FeetApart, has raised an undisclosed amount in angel funding from Nielsen Singapore executive Vishal Bali and a bunch of unnamed investors. The funding process was facilitated through seedX, a platform that enables private placements, FeetApart founder Abhishek Roy told Techcircle.in. Founded in 2014, FeetApart is an app-based social network that helps organisations enhance the fitness level of its employees. It works by suggesting activities, goals and challenges to users. The organisation rewards users for achieving personal milestones and winning competitions. FeetApart was founded by Abhishek Roy and Ashrith G. Roy has previously worked with Sapient, iGate and AOL while Ashrith has worked with Huawei, AdNear and Qyuki. "Organisations are investing a lot in wellness initiatives as it helps improve the culture, employee morale, productivity and reduces attrition and costs. Exercising and staying fit can combat stress which is prevalent in today's population,” said Ashrith. "FeetApart has a great B2B2C model in driving health and wellness in the corporate world. The gamification with team competitions, challenges and rewards also allows HR to engage employees, driving up health and productivity index of the company's workforce,” said one of the investors who did not want to be named. In the social fitness segment, Zywie Ventures Pvt Ltd, which runs well-being assessment and group fitness platform FitCircle, has raised an undisclosed amount in pre-Series A funding from Webaroo co-founder Beerud Sheth and angel investor Ravi Mantha.